The male ski racers on the World Cup circuit took to it last week. The female ski racers will be racing it tomorrow. It'll be part of the FIS World Alpine Ski Championships when they land in Vail and Beaver Creek in 2015. And it's one of the 13 runs you have to ski from top to bottom, lift opening to lift close, at the annual Talons Challenge. Don't ski it early and you could easily be looking at a scary sheet of ice. To some, including the World Cup racers, it's known as the Birds of Prey downhill course at Beaver Creek Resort in Colorado. To others, you'll find it listed on the trail map as Golden Eagle. The double black run can be accessed from the Birds of Prey lift or the Cinch lift, which takes you to the summit, follows a blue trail out of the start gate, and then picks up speed, near drop-offs and jumps before it turns blue again and ends where the Birds of Prey, Grouse Mountain and Larkspur lifts converge. I forgot just how steep and scary this run can get until I was watching the Universal Sports' coverage of the World Cup men. Bode Miller made the run look easy until you saw him panting at the bottom and still catching his breath when he was being interviewed. He eventually took the race but not before other favorites like Aksel Lund Svindahl and Didier Cuche got their skis handed to them on some of the course's wily turns. Turn too early, turn too late and you could be done for. Lindsey Vonn, who calls Vail her hometown, warmed up on the run today in preparation for tomorrow's race--a super-G that was switched to Beaver Creek after there wasn't enough snow in Val d'Isere, France. Chances are that she's making it look just as easy as Miller. As for average skiers, or really those who think they can handle some of the Beav's toughest terrain, the run still isn't easy even when the gates and blue lines to mark the course are absent. The snow can blow right off some of the faces, leaving you to negotiate and sheet of ice. Good luck turning in that if your edges haven't been sharpened in a while. You might feel like you're starting to get the hang of it, mostly because Golden Eagle will flatten a little, but then you go over an edge, one of the jumps on the course, and you're right back to screaming skiing and trying to put the brakes on before you lose control. And sidestepping through the rough patches? That can be just as difficult. I learned the hard way as I started to slide down the mountain, reminiscent of a tumble I took when I caught an edge in Park City's Jupiter Bowl, only stopping when I wrapped around a tree (thank goodness for helmets). An amateur mistake can cost you, but hunt for the snowy patches and turns become so much easier, even in the tougher parts. Now if only I could remember my own advice for next time. 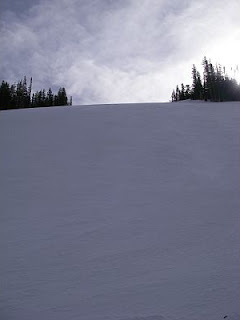 What advice do you have for skiing Golden Eagle with relative ease (or composure and grace)? Wow what a nice post i am really very impressed here can you more share here i will back to you soon as soon possible.